A 1960 Ferrari 400 Superamerica Cabriolet was the most-expensive car sold at the 2015 Amelia Island auctions. 23 cars sold for over a million dollars each: 13 by RM Sotheby’s, 7 by Gooding and 7 by Bonhams. The million-dollar plus cars ranged in age from a 1908 American Underslung to a 2011 Ferrari 599 SA Aperta. In addition to 7 Ferraris and 4 Mercedes Benz cars, 2 racing Jaguars and 4 pre-war American cars sold for more than a million dollars. Prices include auction premium. Some deals may have been negotiated post-hammer but were included in the first results published. Amelia Island 2015 was the first classic car auction since RM Auctions became RM Sotheby’s. RM Sotheby’s, the official auctioneer of the Amelia Island Concourse d’Elegance, had with just over a hundred cars on offer the largest sale of the week. RM Sotheby’s earned an Amelia Island sale record $60 million with a remarkable sell-through rate of 98%. Not only were the two highest prices realized on RM Sotheby’s cars but the auction house sold nine of the top ten most-expensive cars of the week. Gooding & Company earned $27 million with 76 of 85 cars sold for a sell-through rate of 89%. The unsuccessful $4.7 million bid for a 1955 Maserati 200 SI was the second highest bid of the week. Bonhams held its first Amelia Island auction ever in 2015. Bonhams had around 80 cars on offer and earned $14 million with a sell-through rate of 79%. All three its million-dollar results were for pre-war American cars. Ferraris are usually the most-expensive cars at major classic car auctions and Amelia Island was no exception. Seven of the 23 cars selling for more than a million dollar were Ferraris. The top result was for a 1960 Ferrari 400 Superamerica SWB Cabriolet. RM Sotheby’s set a new model record when it achieved $6,380,000 on this car with a rare dark green body. RM Sotheby’s will have two further 400 Superamericas in The Andrews Collection sale on May 2, 2015. The only other multi-million dollar Ferrari was a 1961 Ferrari 250 GT Series II Cabriolet – the second highest result for Gooding. Gooding sold a 1991 Ferrari F40 for $1,622,500 – immediately after the highest bid of $1.45 million was rejected. Bonhams had an unsuccessful highest bid of $1,050,000 for a 1992 F40. RM Sotheby’s similarly sold the 1953 Ferrari 212 Europe Coupe by Vignale for a $1,550,000 price negotiated after the hammer came down. RM Sotheby’s set a new model record of $1,155,000 for a 2011 Ferrari 599 SA Aperta. This Ferrari was the newest car selling for over a million at the auction. A 1931 Alfa Romeo 6C 1750 Gran Sport Spider by Zagato sold for $2,420,000 at the RM Sotheby’s auction, which must have been some relief after similar 1930s Alfas struggled at the Paris 2015 sales. A 1971 Lamborghini Miura SV sold for $2,310,000 at the RM Sotheby’s auction. This car was used to set the fuel consumption data as the first car imported to the USA. A 1955 Maserati 200 SI had the second highest bid of the week but $4.7 million failed to buy the car. A 1953 Fiat 8V Coupe had a Ferrari-like bid of $1.2 million rejected. Several Mercedes Benz cars were on offer at the 2015 Amelia Island classic car auctions with four selling for more than a million. A 1935 Mercedes Benz 500/540 K Carbiolet A sold for $3,025,000 at RM Sotheby’s as the most-expensive Mercedes Benz car sold thus far in 2015. A rare 1956 Mercedes Benz 300 Sc sold for $1.1 million at the same auction. The Mercedes Benz 300 SLs sold well below the expectations at the Amelia Island auctions in 2015: Gooding sold two 300 SL Roadsters for around $1.25 million while RM Sotheby’s saw a 300 SL Roadster sell for only $902,500. The 300 SL at Bonhams was withdrawn prior to the sale but four 300 SLs will be on offer at the Bonhams Mercedes Benz Sale in Stuttgart end March 2015. Porsches often do well at Amelia Island and in 2015 Gooding sold the “Café Mexicano” 1974 Porsche 911 Carrera 3.0 RSR for a model record of $1,237,500. It was the first time this year that a 911 sold for over a million dollars – several came close or had bids over a million dollar refused at recent auctions. 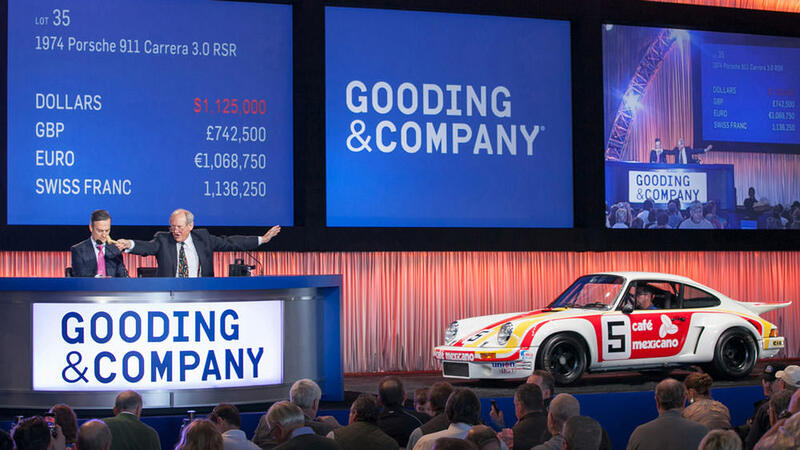 It is also the highest price for a 911 since $1.4 million was paid for a 1971 Porsche 911 Carrera 2.7 RS Lighweight at the Gooding Amelia Island 2014 sale. Several American cars sold for more than a million dollars at the 2015 Amelia Island auctions. $1,738,000 for a 1908 American Underslung 50 HP Roadster – a new model record for what many consider the first American sportscar. $1,012,000 for a 1932 Stutz DV-32 Super Bearcat Convertible. RM Sotheby’s sold a 1930 Duesenberg Model J for over a million while Gooding failed to find a buyer for a 1934 Duesenberg Model SJ but sold a 1932 Lincoln KB Custom Stationary Coupe for $836,000. However, the most-expensive American car was a 1967 Shelby 427 ‘Semi-Competition’ Cobra that RM Sotheby’s sold for $2,117,500. At the same auction, a 1963 Shelby 289 Cobra sold for $990,000. A 1955 Jaguar D-Type sold for $3,675,000 in a deal negotiated post hammer. The 1988 Jaguar XJR-9 that won the 1990 Daytona 24 Hours sold for $2,145,000 – nearly a million dollar below the lower estimate.